The Lincolnshire Showground was the venue for the return of the Food and Gift Fair over the weekend of Friday 22nd to Sunday 24th November. A celebration of local produce now in it's twelfth year, the aim of the event is to offer as much variety as possible with Christmas in mind all under one roof. There were over 150 stands spread throughout the two large exhibition halls. In addition to the tasty treats and gift ideas provided by the exhibitors, visitors could also enjoy cookery demonstrations, craft workshops and live music. The weekend commenced with a preview evening on Friday 22nd November where guests were entertained by RAF singer Sarah Jane as they browsed the food and gift stands and sampled some of the produce. 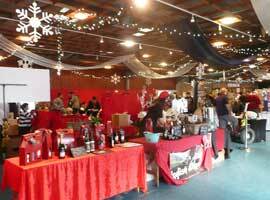 The Fair opened at 10am on Saturday 23rd and Sunday 24th November with both days seeing record attendances. 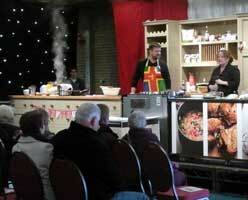 In the cookery demonstration area, cooks Amy Claridge and Dominic Franks were back by popular demand. Visitors could also watch Uncle Henry's head butcher making the perfect Lincolnshire Sausage Sandwich and explore the breadmaking process with Welbourne's Bakery. The Fair showcased a range of crafts and skills and visitors were encouraged to participate in a variety of craft workshops. This was the second year Susan had conducted her pyrography workshop at the event and once again it proved extremely popular. There was also the opportunity to learn how to make an Advent wreath with Flowers by Suzanne, Christmas decorations with Tempo Designs, baskets woven from recycled paper with Revival and button brooches with Jolly Posh. As well as hot food and drink being available throughout the day, live music in the form of carol singing was provided by local All For One adult choir on Saturday and youth group Choir Vibe on Sunday. There were two performances each day comprising a selection of traditional, modern, gospel and soul Christmas tunes. The thirteenth Food and Gift Fair will take place on Saturday 29th and Sunday 30th November 2014 with the preview evening for Lincolnshire Agricultural Society members only on Friday 28th November. Advance tickets are available online from September 2014. For more information please visit www.lincolnshireshowground.co.uk .